I live in a old house–it is over 100 years old and was built by the Suttons who owned a car dealership. 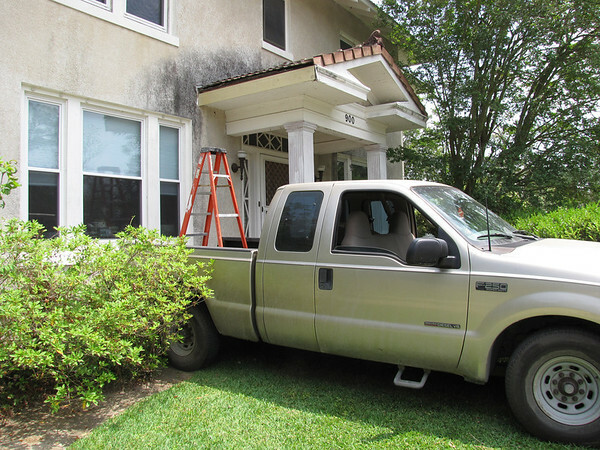 We are just the third owners of this house and it is a very sturdy house having survived hurricanes and tropical storms with not much more damage than the loss of a few roof tiles. A month or so ago, we noticed the front porch siding was rotting. We replaced it once when we moved in twenty years ago, after Hurricane Rita a contractor replaced it but with regular lumber–not pressure treated. So we decided to try Hardy Board. We got one side completed with a lot of maneuvering of my truck as a short scaffold but decided the other side will be left to a professional contractor to complete.